An occlusal guard is a piece of acrylic (plastic) that prevents and separates the teeth from grinding and is the substance that is worn so your teeth are not. These are specifically fitted for each patient and their bite. 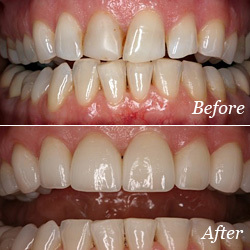 When someone has a tendency to grind their teeth at night, this can be a very destructive process that can lead to significant negative consequences for the dentition including shortening of teeth, fracture of teeth, promoting shifting of teeth, and poor esthetics among others.